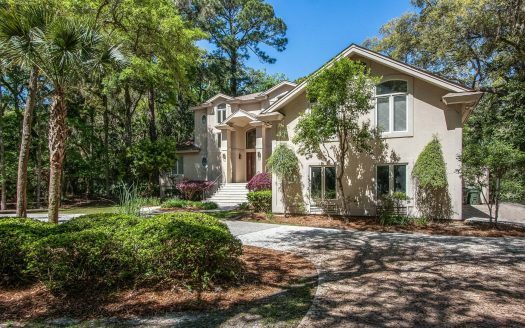 8 Oyster Catcher is an open and airy home that provides the best of golf lodging on Hilton Head Island. The living, dining and kitchen are all together in the expansive, great room where skylights and tall, floor to ceiling windows make the room bright and open. This room opens out to a beautiful screened in pool. There is plenty of comfortable seating, a large flat screen television and a game table that seats 4. The updated kitchen has granite counter tops, stainless steel appliances and a large breakfast bar with 6 bar stools. A separate laundry room is located off the kitchen. As you enter the home through the tiled foyer, the great room is to the right. Three bedrooms are to the left. The master bedroom, with a king bed, is located at the end of a hallway at the back of the home. 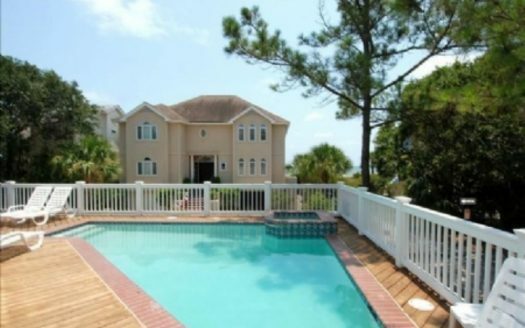 It has sliding glass doors out to the pool area, vaulted ceilings and a 41” flat screen TV. The private bathroom has a separate tub with glass walls that look out to a walled garden and a separate shower. Two other bedrooms are off of the same hallway. One bedroom has a queen bed, a small walk in closet and a private bathroom with a standard combination tub and shower. The third bedroom has 2 twin beds and shares a bath with the hallway. The fourth bedroom is accessed by a spiral staircase from the great room. This is a loft bedroom that looks down into the great room and has shutters for privacy. It has a king bed and a private bath with a shower only. 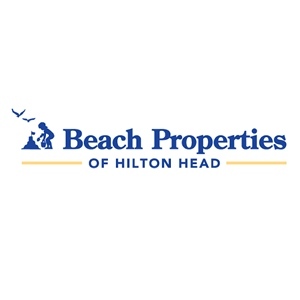 The beach is accessed by walking on pavers through tropical landscaping to the beach path, and it is only a 2 minute walk to the glorious Hilton Head Island beach. Guests can enjoy the natural surrounding from the screened in pool area that has lounge chairs for relaxing. 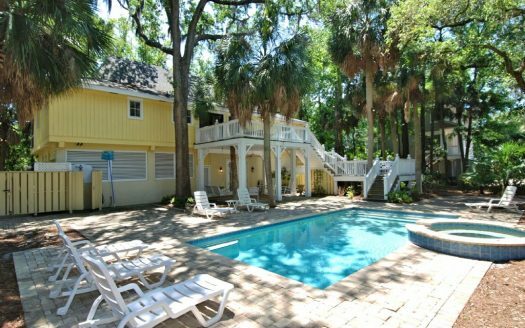 While staying in 8 Oyster Catcher, be sure to check out the fabulous golf courses located on Hilton Head.